You join a new ball of yarn when you’ve crocheted to the end of your current yarn. Joining a new ball or skein of yarn correctly is as important to the appearance of your crochet work as the actual stitches. Don’t give in to the temptation to just tie the beginning end of the new ball to the tail end of the first ball. This sloppy method produces an unsightly knot in your work. Join the new yarn in any stitch of the row, but making the transition at the end of the row creates a neater appearance. Double crochet (dc) across the row, stopping before the last stitch of the row. Work the last double crochet to the point where only 2 loops are left on the hook. Wrap the cut end of the new yarn around the hook, from back to front. The working end (the one that’s attached to the ball or skein) should be the end closest to you. Draw the new yarn through the 2 loops on your hook. You have 2 strands of yarn hanging down. Tug on the dropped end of the old yarn at the base of the double crochet to tighten up the stitch. Remove the loop from your hook. 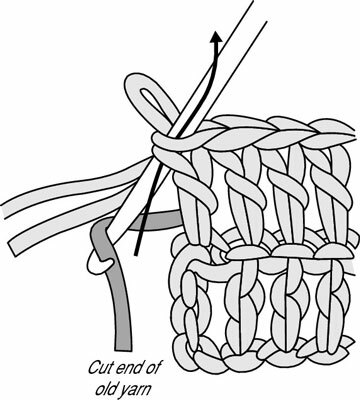 Insert your hook into the top of the last double crochet down through the center of the stitch. 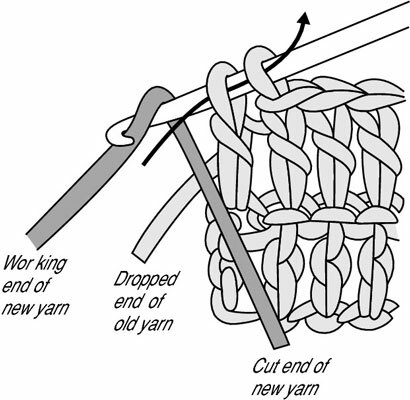 Yarn over (yo), using the end of the old yarn at the bottom of the stitch. Draw the tail end up through the stitch. Stick your hook back through the loop and begin your next row.